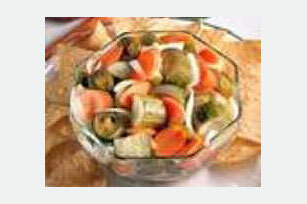 Sliced dill pickles, carrot, onion and pickled jalapeños are marinated and served alongside grilled meats and fish or with tortilla chips and salsa. Cut pickle halves in 3/4-inch slices. Mix pickles, carrot, onion and jalapeno peppers in bowl or zipper-style plastic bag. Add reserved pickle and jalapeno liquids; cover. Refrigerate 2 hours or overnight to marinate. Serve as side dish with grilled meats or fish or as an accompaniment to tortilla chips and salsa. Serve as a side dish with grilled meats or fish or as an accompaniment to tortilla chips and salsa.